A wide-reaching article on the use of Stingrays by Annapolis police shines light on a number of problems with the devices. Stingrays work by simulating a real cellphone tower, pinging all nearby cellphones until they connect with the device, at which point it can track their location, and in some cases intercept phone conversations. The device itself is already worrying, owing to the completely indiscriminate nature of its data collection. But even stranger is the secrecy surrounding the device. The FBI, which provides Stingrays to some police departments, forces other law enforcement agencies to not disclose the existence of Stingrays. In some cases, that’s led to otherwise-solid cases being dropped, in case the use of Stingrays is explored in public during a court case. The lack of knowledge about the case is what makes it so worrying. 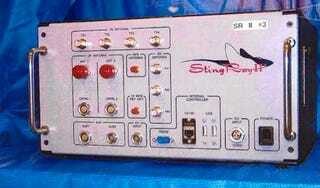 It’s easy to justify the use of a device like Stingray if it’s being used as part of a counter-terrorism operation, where the stakes are high; it’s harder in one case cited by Capital, where Stingray was used (unsuccessfully) to track down the the case of a pizza deliveryman who reported being robbed of 15 chicken wings and three subs while out on delivery. *Correction: The case was in Annapolis, not Baltimore.